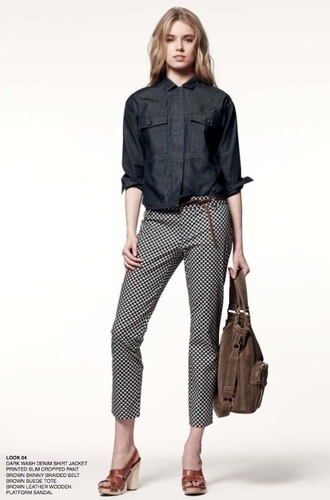 The Gap has previewed their Fall 2012 collection and it’s super. They are finally returning to what they do best-cool, classic,style. The line features must-have basics like tailored wool blazers in rich autumnal hues, embellished sweaters, and classic khakis and denim (but with a cool, modern twist). They are plenty of statement pieces along with adorable accessories like cozy scarves, wedge sandals, and colored ballet flats. It’s refreshing to see The Gap revisiting their roots. Here’s a peak at the looks I love the most. 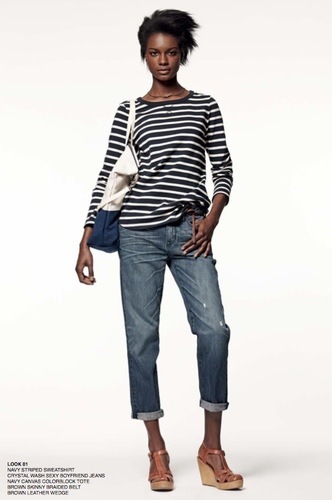 Stripes and boyfriend jeans are still on trend so don’t get rid of them yet! It’s been a long time since I’ve worn a turtleneck under a woven, but I find it somewhat inspiring. 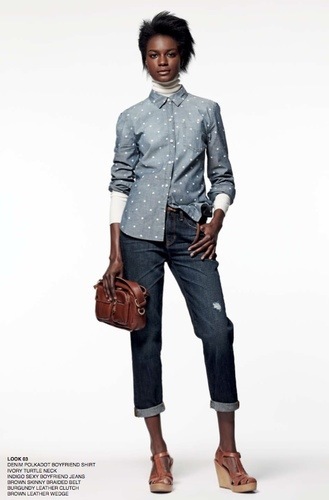 The structured work shirt is made feminine with polka dot capris. Shirt dresses are huge for fall and the white is just so classic and crisp. Love this look! Cardigan with elbow patches, a classic sweatshirt, and baggy jeans are a super comfy emsemble. Denim dress with skinny black denim can look very sophisticated when you pair it with the right accessories. Wearing a turtleneck under a sweater puts me right back to high school! Paired with boyfriend denim you have the perfect weekend look. The right jacket can class up any outfit and this khaki one has a super fun silhouette. This is a modern twist on 80’s preppy girl. 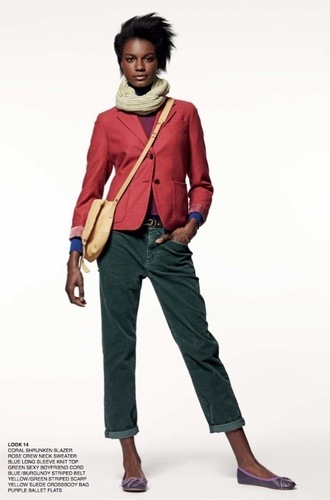 I adore cords and paired with a colorful blazer they scream fall. Wearing a sweatshirt doesn’t have to make you look frumpy. Paired with a fitted jacket and cords gives you a wonderful silhouette. It’s okay to take risks with color and pattern. The scarf is a surprising choice with this striped sweater, but it works! I’m certainly not wishing away summer (it is my favorite time of year), but it’s nice to know fabulous fall fashion will be waiting for me when the leaves start to turn. CAN’T WAIT!!! Your first three selections have my favorite styles – stripes and polka dots. Now if only they had some ruffles……….. This was only a little of the selection. Maybe they will have some ruffles!